But the pair's proposal is likely to face suspicion from Republicans, as well as strong public opposition from law enforcement, worried about how it might unwittingly introduce more deadly fentanyl into the United States. The Safe and Affordable Drugs from Canada Act (SADCA), introduced by Grassley and Klobuchar, would permit individuals to legally fill prescriptions at Canadian pharmacies assuming that the drug they are seeking is not a controlled or otherwise dangerous substance. This is not Klobuchar's first partnership with a Republican on the issue; in 2017, she joined with then-Sen. John McCain (R., Ariz.) to try to pass the SADCA as part of the Senate budget bill. Grassley, who the Hill reports has long been a proponent of prescription drug importation, argued that his and Klobuchar's proposal would help families unable to afford sky-high American drug prices. 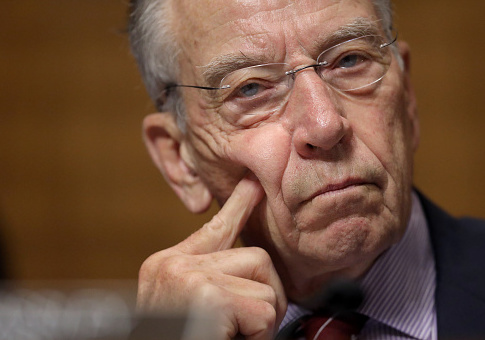 "For decades, safe and affordable prescription drugs have been for sale just across the border, but legally out of reach for American families," Grassley said at the time of the SADCA's release. "It's long past time for Congress to help the millions of Americans who struggle to pay exorbitant prices for medication." A longstanding, popular proposal for addressing this problem has been to make it legal for Americans to import drugs from foreign countries for personal use. Current regulation, enforced by both the Food and Drug Administration and the Drug Enforcement Administration, prohibits the practice, out of an abundance of caution concerning the competency of other nations' drug safety authorities, and fears of importation becoming a route for controlled substance trafficking. Were importation to be legalized, however, Americans could take advantage of price differences between the United States and foreign countries—including, critically, Canada. Prescription drug prices are lower in America's northern neighbor primarily because a government board sets them; this reality allows cross-border arbitrage, a fact that some 8 percent of Americans admit to having taken advantage of. Grassley and Klobuchar's bill is not the only one up for discussion in this Congress. Sen. Bernie Sanders (I., Vt.) has his own, more sweeping proposal—cosponsored by 2020 contenders Sens. Kirsten Gillibrand (N.Y.), Kamala Harris (Calif.), and Elizabeth Warren (Mass.). Sanders's Affordable and Safe Prescription Drug Importation Act would permit importation from not only Canada, but also other "major countries." Republican senators have already expressed skittishness about even Grassley’s more-narrow proposal. Sen. Mike Rounds (R., S.D. ), speaking to the Hill, said that he does not necessarily trust other nations' lower safety standards. "Unless we've got a case we're able to look back through and make sure we've got the same safeguards coming from there, I'd be a little bit leery," Rounds said. Rounds's caution is moderate compared to the objections of the National Sheriffs Association, a law enforcement organization which also opposed the Klobuchar-McCain proposal in 2017. The NSA, which represents "thousands of sheriffs, deputies and other law enforcement" nationwide, issued a statement explicitly opposing importation of drugs from abroad, arguing that it would make it easier for illicit online pharmacies, which routinely distribute fentanyl, to prey on American consumers. In a letter to President Donald Trump last August, the NSA cited a 2017 study by former FBI director Louis Freeh that found drug importation would strain law enforcement resources and increase the risk of Americans' exposure to deadly counterfeit prescription pills. "Given the current crisis already faced by law enforcement with illegal drugs and the abuse of prescription drugs, now is the not the time for the enactment of drug importation legislation that would only exacerbate that crisis in public health and safety," said NSA Executive Director and CEO Jonathan Thompson. This entry was posted in Issues and tagged Drugs, Opioids, Senate. Bookmark the permalink.